Our Collapsible Toy Storage Box is lightweight and the ideal size for holding various kid items! Its double handles make carrying an easy task and its durable sturdy material prevents breakage. When not in use it can be folded flat to conserve space and its creative design will steal the hearts of kids who love dinosaurs! ★Collector Toy Bin & SIX Dinosaurs - A brilliant addition to our toy collection! 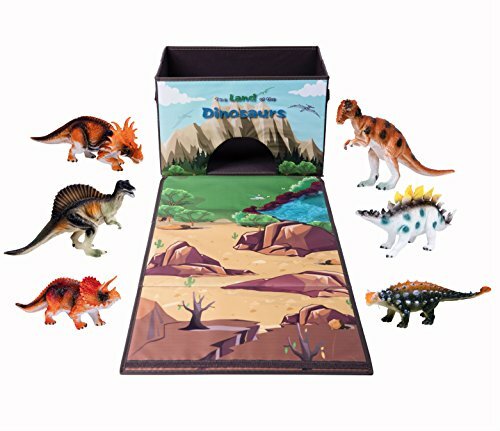 Each set includes 6 types of dinosaur figures and a lid which can be pulled out and used as a play mat. This set is perfect for children who love dinosaurs. ★Ideal Party Gift - This dinosaur play set is also designed for storage, where you can easily store toys to help organize the playroom. Great for school education, gifts, and fun play! ★Safety Ensured - Toy box is 100% polyester are safety certified and Plastic toys have been tested by ASTM standard. ★Large Size - Box: 15.4"L x 10.2"W x 9.8"H. Dinosaurs: 5.1" L x 9.5"H.